The Royal Institute of the Architects of Ireland (RIAI ) last Friday announced Killsallagh by Aughey O’Flaherty Architects, as the winner of Connacht House of the Year at the 2017 RIAI Irish Architecture Awards. The prize was awarded at a ceremony in Dublin’s Mansion House, attended by over 400 RIAI members. 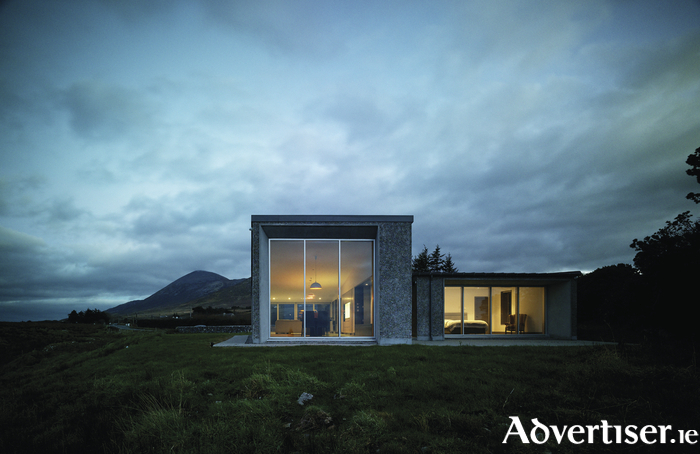 Killsallagh is a newly built house in Mayo which boasts views of Croagh Patrick to the east and Clew Bay and the Atlantic Ocean to the west. It is made from two joined forms, each open ended and orientated towards the two different views. Bedrooms are located in one end and living spaces in the others. The forms are held apart to make an entrance and staggered resulting in shelter for each outside space; one for morning, the other as an evening terrace.